Joshua returns to the new Collinwood in the wee hours to find Naomi, who informs him that Sarah has died in accord with Vicki’s prophecy. Visiting her in jail, Joshua rejects Vicki’s explanation that she is from the future, as is her knowledge. Later, Ben visits Barnabas in the mausoleum to describe Sarah’s funeral. Barnabas has heard his parents express genuine compassion at the death of his sister, and is moved to agony. After pondering his options, Barnabas asks Ben to ready a stake and end his existence. 1795 is such quintessential DARK SHADOWS, but that doesn’t make it comfortable to watch. It is nonetheless deeply fulfilling. An episode like this is the show at its most essential and primal. Let’s face it, even on an ensemble show, Barnabas is the protagonist. Although crucial things happen to him in other storylines, no other arc is his quite like this one. And there are few episodes in it that show such vital moments and decisions as poignantly. 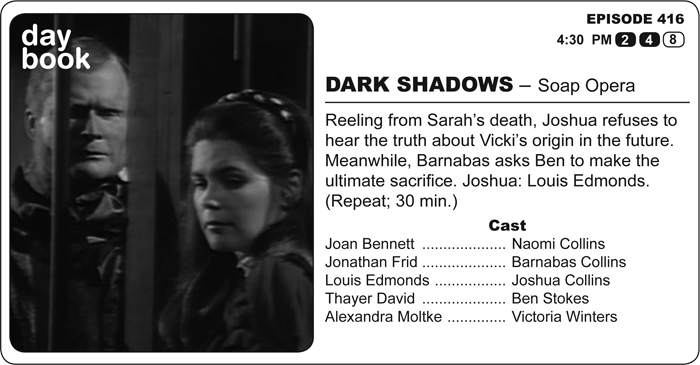 We may not know Vicki’s outcome, but we know Barnabas’. Still, the conviction with which the writing and acting is aflame is so intense, it’s easy to believe that we are seeing Barnabas’ best moments. Speaking of best moments of sheer drama, both Joan Bennett and Louis Edmonds are at their finest. Both Naomi and Joshua find strength through the appearances they carefully maintain for others -- even each other. To see those break down is just heartbreaking. Notable on this day in 1968 was the capture of the USS Pueblo. It was a spy ship with a complement of 83 found in the Sea of Japan by North Korea.